Monster Anatomy HD – Lower Limb is a truly amazing app. Showcasing what the iPad is capable of, Monster Anatomy HD is a comprehensive radiological reference of the lower limb. Developed by Monster Minds Media in collaboration with the Medical Imaging Department of the University Hospital Center of Nancy, France, Monster Anatomy HD is an accurate and intuitive radiology reference tool. 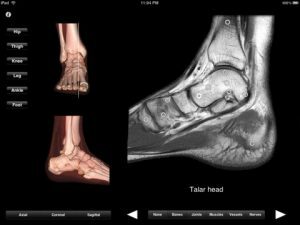 Monster Anatomy HD features 384 contiguous magnetic resonance imaging (MRI) slices (4-5mm thickness) in the three standard anatomical planes (sagittal, coronal and axial). Switching between the planes is as simple as tapping the button for the relevant orientation. Buttons on the left of the screen enable you to move quickly to a region of interest, i.e hip, thigh, knee or foot. 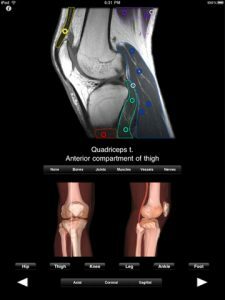 From here, two 3D reconstructions of the relevant bony anatomy with a white line representing the level of the MR slice allows you to assess different structures with precision. You simply slide your finger up or down to move the white line in a superior or inferior direction. As you do this, the MR images are updated on the right of the screen allowing you to instantly visualize the structures of interest. With over 500 labeled structures and 10,000 tags, Monster Anatomy HD allows you to hone in on every single anatomical detail. 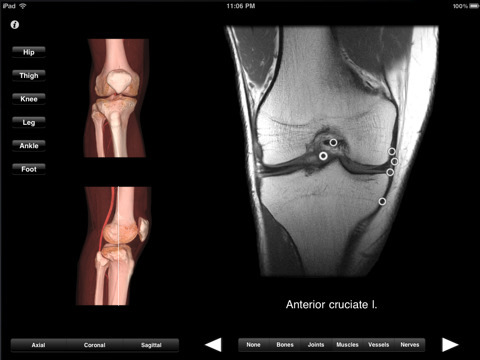 You can tap at any time to highlight bones, joints, muscles, nerves or vessels in any slice, and in any plane. Bottom Line: A fantastic reference tool for the medical professional. 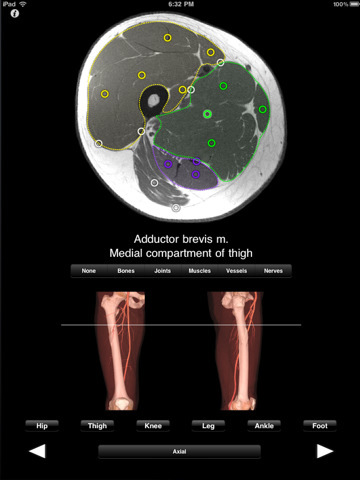 Monster Anatomy HD – Lower Limb [iTunes Link] is compatible with iPad. Requires iPhone OS 3.2 or later.